Breakfast is the most important meal of the day. If you’ve had a hearty breakfast then its less likely that you will binge on unhealthy snacks in between meals. Making kids have breakfast is a big task. Sometimes its best to give them some healthy muffins which are loaded with fruits and nuts. The baking bug does not stay away from me for too long. Have been busy baking some of the already blogged recipes. I had this muffin recipe in my book for quite a while and I finally got down to baking them yesterday. Its amazing how quickly one can make muffins once all the ingredients are at hand. The muffins turned out just right…. soft, not too sweet and healthy. Ideal carry away breakfast for all those who don’t have time to eat breakfast… walk to work and eat them (personally I can never do that), eat it in the train or the car. Have them for break, its filled with loads of all good things. Kids will love a muffin in the lunch boxes. Please don’t be put off by the long list of ingredients. Preheat the oven to 180°C. Line the muffin tray with cake cups. Mix milk and vinegar and let it sit for 10 -15 minutes. Sieve the flour, baking powder, soda bicarbonate, cinnamon powder and salt together. Add the flax seed powder, oats, chocolate chips, raisins, blueberries and walnuts. In another bowl add all the wet ingredients (milk vinegar mixture, maple syrup and oil) and sugar. Whisk very well. Add the dry ingredients and just mix till the flour becomes wet. Do not over mix. Spoon the batter three quarter full into the lined muffin tray. Bake in the oven for 20- 25 minutes. Prick with a fork or toothpick in the middle of the muffin. It should come out clean if the muffins are done. Remove the muffins from the tray and let them cool on a wire rack. Use either dark or milk chocolate chips. Instead of chocolate chips add nuts. Use nuts of your choice. I prefer to roast the flax seeds before grinding. Replace the brown sugar with a healthy sugar like jaggery, palm sugar or coconut sugar. The breakfast muffins looks so scrumptious just perfect for breakfast at the go , if we don’t have maple syrup what can we substitute it with, will try this recipe soon bookmarking it. Thanks Soma, you can replace it with honey. It tastes equally good. Those breakfast muffins looks absolutely incredible to enjoy with any fuss. They are just prefect to kick start a day.My kind of muffins.. Thanks Nandita and when you do, please share it with me. I love whole wheat flour bakes. Blue berries chocolate chips walnut definitely made these muffins delish. Fabulous share Mayuri. Always love your awesome bakes . Thanks Sujata. These are my favorite muffins. This is simply wow, such a healthy treat for breakfast. My kids will love to eat their breaky everyday with this. Totally agree with you! I’m a breakfast person myself. Somehow day doesn’t begin right when I don’t eat a good wholesome breakfast. These muffins are very nutritious and look yummy too. I can imagine enjoying a couple with my morning cup of black coffee. Good for grab-and-go breakfast too. Thanks Maria. Yes these muffins are ideal for grab and go. 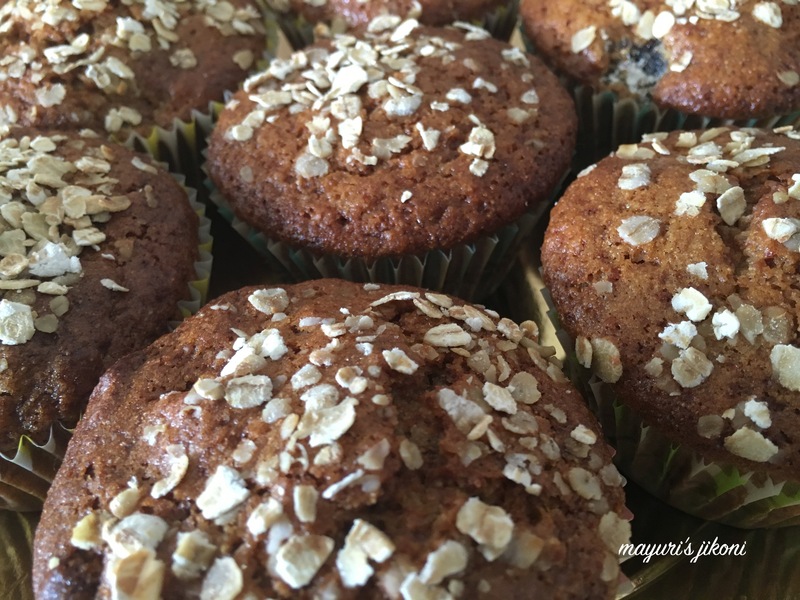 These oats and wheat flour muffins with goodness of fruits and nuts are just perfect way to start the day di ! Lovely share ! Muffins looks damn yummy & loaded with so much healthy & yummy ingredients. perfect wholesome meal. I love the crumb like topping on the muffins. I love your recipe too, it will be perfect. Breakfast muffin actually a great idea with milk or tea. I have been thinking to make from a long time I got from clean eating book. You reminded me to make it. Love these. Thank you and please do try the recipe. These breakfast muffins amazes me as they are eggfree yet how soft and moist they are. Looks so delicious, I would wake up even at 4am if someone bakes these for me. I like to start my day with freshly baked healthy muffins and a cup of tea. Nothing can beat the aroma of freshly baked goodies, right?? That is definitely right Sapana, however, I don’t always have a muffin for breakfast. Thank you so much Anshu. Lovely healthy bunch of muffins to kickstart your day! Love that they are eggless too…fabulous! These healthy breakfast muffins is what I need for my breakfast to kick start a day. Sounds healthy yet delicious. Never tried flax seeds for baking. This is a must try recipe. Thanks for this amazing recipe. Thank you so much Geetha.